Linderhof's kitchen is tiny -- a mere 10 x 10 feet of floor space -- and it is not a decorated kitchen but rather a functional one. As you walk into the kitchen from the dining room, the stove is on your left, the fridge is on your right and there is an island smack dab in the middle of a 10 x 10 space. Are we crazy? Probably, but I wouldn't have it any other way. It's a great space and one that is used daily! The work space at Linderhof -- next to the stove with built in choppng block, marble counters, wooden spoons and other utensils, the Kitchen Aid and food processor and sugar and flour . 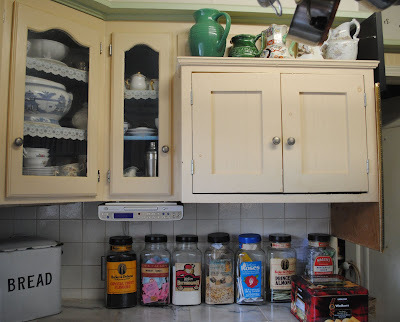 . . and hanging from the upper cabinets -- measuring cups and spoons -- nice to be so near at hand. 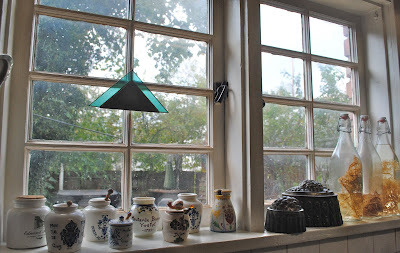 For a little kitchen we are blessed with two windows -- this one over the stove where I keep my collection of French mustard pots, a couple of neat old molds and three bottles of my homemade tarragon vinegar. What's a kitchen without a window over the sink . 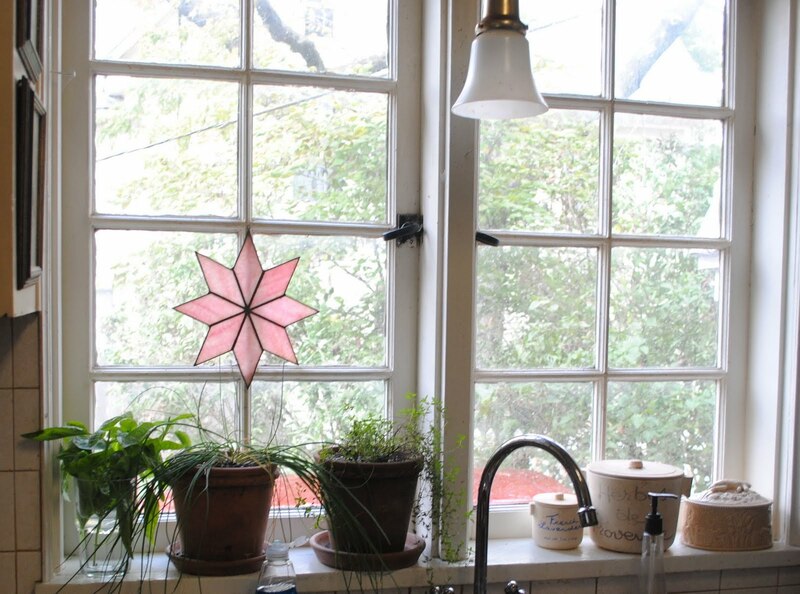 . . a great view of a small garden and a great place in the winter for windowsill herbs. There will also be a rose geranium as well as a pot of parsley. They just haven't made it inside yet to join the chives and thyme. My English "Sweetie Jars" full of coffees and teas and sugars. As well as an English enamel bread box. Which is used for . . . . bread! The big tin of Walker's shortbread. My afternoon nosh with tea while I was recovering from surgery. Good for boughten shortbread but not as good as my homemade! Once upon a time, I had the ceiling redone in the kitchen because of a leak. The handyman managed to get "mud" on the wallpaper of my soffit . . . and so, off I went in search for some new paper for that soffit. I managed to buy the world's ugliest wallpaper . . . . at least that's what I figured when I put up two sheets (thank heaven they were soffit size sheets) and so . . . . I painted my soffits white, then painted grapes and grape leaves near the ceiling . . .
And searched through my box of design ideas until I came upon the one that I was looking for -- with writing . . . about wine . . . in a kitchen . . . . and so with stencils in hand, I stenciled away that saying -- one part on each of the three walls and then a fourth wine related saying on the fourth wall. The kitchen at Linderhof -- the heart of Linderhof -- where good food begins. A bowl of fruit and a pitcher of tea are always on the island. The crock pot is full of steel cut oats for breakfast oatmeal -- so easy to make a big batch in the crock pot and oatmeal is perfect for these cool fall mornings. The island countertop is a 100+ year old piece of marble that came out of the kitchen in the 1885 building where I used to work. It's a great pastry marble. The countertops, too, are marble -- carrera marble and I love them. There is a built in butcher block next to the stove -- I love that feature. The cabinets are painted a 30's green for the lowers and a 30's cream for the uppers. Windows are left bare to let in more light to this little space. The floor, like the rest of the house, is oak. I'm joining Shelia today in the Heart of the Home Party -- please visit Shelia at Notesongs to visit every one's kitchen today. It should be a fun party!!! This is the kind of kitchen that I love! It definitely has heart. It's warm, inviting, beautiful and has so much personality. Gorgeous!! A beautiful heart for your home! A decorated kitchen if fine, but a working kitchen is essential if one likes to cook. Your kitchen is very attractive and it works! Yes, I added the cinnamon and nutmeg to the cake. There isn't a crumb left - it was a hit and will appear again, for sure! Obviously, you get a lot done in that kitchen. It is a great example of using a space well. It also has so much charm and character. Thank you for the tour! I like it! Interesting background on the marble. Isn't it great to have such history? Now, I'm off to google steel cut oats and crock pot recipes. I love your kitchen! Your wine mottos are sure to make anyone smile. What a leafy and green view you enjoy from your windows. Isn't this a fun party? I love your kitchen! I was going to join the post today but just couldn't pull my act together because of various workmen in and out with estimates for insulation. However, when I finally do post, you will see that the new color of my cabinets are almost the same as your top cabinets. I, too, have a small but very functional kitchen. It is almost the size of the pantry in our last home! I love my kitchen too! Oh your kitchen is charming. It is easy to tell a really good cook lives there. 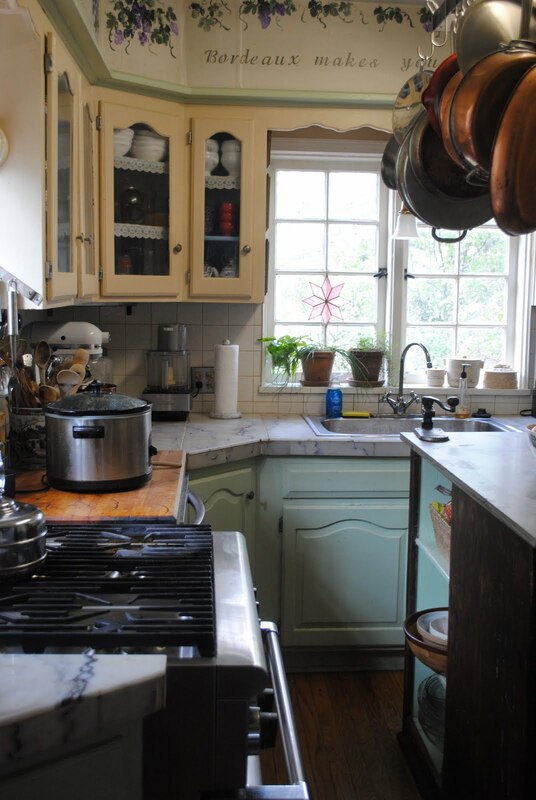 I really like the built in butcher block, the marble, and especially the herbs in the windowsill. Very nice. Does your Kitchen Aid mixer have a copper mixing bowl? I have never seen one of those! I have tiny kitchen as well. It's quite functional, just wish I had a lager breakfast nook or family room off of it. I love your cabinet paint colors!!! What a wonderfully personal kitchen! It is just what I THOUGHT would be at the "Heart of Linderhof"! I LOVE this kitchen. It is warm, full of charm and personality..it is JUST what I thought your kitchen would look like. 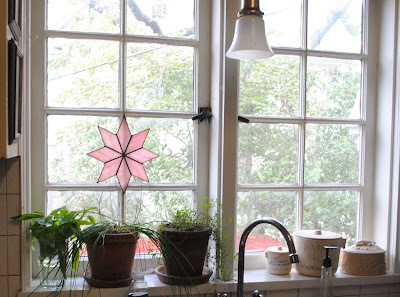 It is sometimes hard to make a kitchen look warm and homey...I love this!! OH, I want your kitchen Martha! Everything is so pretty and charming! I really adore those cabinets with glass, I would love to have those and your copper collection makes me swoon! Martha, you can feel it's heart just from the pictures! Love it, love the marble , old fashioned warmth of it all! Like the rest of Linderhof, the kitchen is terrific! Love the colors, the functionality, the history of the island, and that beautiful thick carrera marble countertop! Love your mustard jars! I have one I kept upside down spoons in on the counter. Your kitchen is very inviting. Thanks for sharing. Stopping by from Note Songs party. I hope you'll drop by Atticmag to see our kitchens - it's a three for one! I love the soffit designs ... warm & welcoming kitchen. I like your kitchen! Love the yellow cabinets! The wine mottoes are really neat! So glad to see where that wonderful Apple Cake was baked. I did make the cake this weekend. I made the sheet cake. It went over fabulously. I have to get that photo before it's all gone.I plan to make it again for a garden club luncheon next Monday. I love your kitchen! It looks like a real cook lives there and uses it. 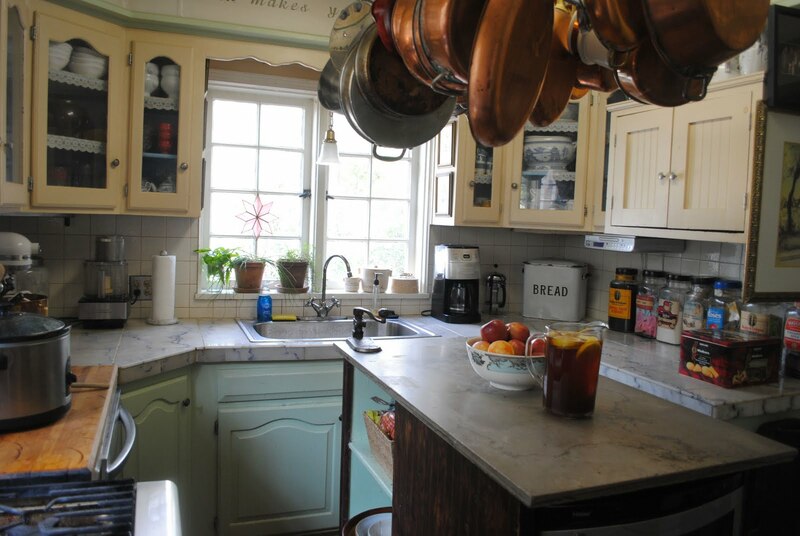 The marble counter tops are gorgeous! I love your kitchen, especially your soffit painting and your collection of mustard pots. Lovely Linderhof kitchen. . .shows to be a true workhorse and yet so charming and welcoming. I, truly, enjoyed the window of herbs! Thank you for this inspiring post! Makes me want to run right out and stir up a pot of homemade soup for our cooler evenings here on the prairies. Hi Martha and thank you for the tour of your wonderful kitchen! Small is good. I have a little bitty kitchen and it's perfect! We could run our tiny legs off in one of those big kitchens! I love the colors you've used on your cabinets and everything is within reach. Your island is marvelous and I love your marble countertops! Now I'm really coveting that wonderful looking pot rack you have! Maybe one day I can have one. Thank you again, Martha, for coming to my party. So cozy and charming kitchen! Love it! Awww! the perfect kitchen..I have dreamed of white marble (One day) I hope to have it. 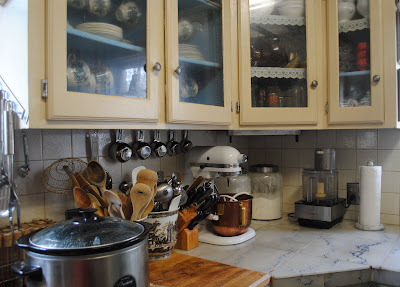 I adore every aspect of your kitchen it works and its pretty! I adore it! OOh i love your kitchen. It's warm and inviting and you can tell that there is a lot of love that happens there. What a sweet kitchen. I really love your island and the marble. Very nice! Such a warm and friendly kitchen. I love a kitchen that gets a good work out. I just adore your kitchen, Martha. AND I am in LOVE with the marble countertops.